On Saturday, April 29th people came together to demand action on climate change. This is one of a series of protests with a message for the Trump administration, Republican lawmakers and the business community. At the end of April large numbers of people, organizations, and even a few forward looking businesses came together in support of climate action. In Washington DC alone more than 200,000 people assembled for what was called "The People’s March for Climate, Jobs, and Justice". The march shut down Pennsylvania Avenue, surrounded the White House, and rallied in front of the Washington Monument. Thousands of others also marched in almost 400 cities across the US and dozens of countries around the world. Countries that held marches included Brazil, Canada, Costa Rica, Germany, Greece, Japan, Kenya, the Philippines, Mexico, New Zealand, Uganda, and the UK. In 2013 we saw the beginnings of a new environmental movement that culminated in the first Peoples Climate March in 2014. The largest climate march in history may have heralded the birth of the next generation of environmental protest. The 2017 event was timed to occur on the 100th day of Trump's term as president. 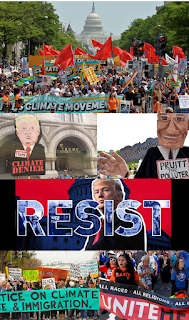 The march was organized by the Peoples Climate Movement and it calls attention to the assault on the climate achievements of President Obama by both the GOP-controlled Congress and the Trump administration. Many of those present had also been present at the March for Science the week before. These events follow other protests including the highly successful Women's March in January. Protestors acknowledge that climate change is a high priority issue and they are demanding that the US government joins the international community and adopt science-based policies commensurate with the threats. Protestors also want businesses to know that people care about the environment and climate change. This has implications for the way businesses operate. Smart business owners and CEOs are already engaging sustainability mindful of the fact that people are demanding action. Some progressive businesses even attended the April climate protests. One protestor at the Peoples Climate March was quoted in the Atlantic as saying, "[the march] also sends a message to the corporations that really run things that people care." Virgin's Richard Branson was there, but so were small business owners. One protestor brandished a sign that said "CO2 Is Hurting My Oyster Farm". Bill Mook, is a 63 year old sea farmer who has had to contend with the impacts of a rapidly warming world. First he had to deal with ocean acidification and then oyster contamination by human pathogens due to the warmer ocean waters. "This is the first time I’ve ever really marched. I feel passionately about it. And this is directly impacting my business," Mook said. Some socially-responsible businesses are putting values into practice through advocacy. Companies like Ben & Jerry's, Patagonia, New Belgium Brewing Company and many others participated in the Peoples Climate March proudly proclaiming that activism is consistent with their brands. Those who are presently not on board may find themselves pulled into the gravitational orbit of this strong and growing movement. Despite the scientifically inaccurate information coming out of this administration, business leaders know they are playing with longer-term time horizons than elected officials. Forward-looking businesses know that this administration will end and reality will one day return to government. Increasingly we are seeing an "intersectional" outlook which implies that there is overlap between climate change and other problems. Environmental groups are reaching out to others to broaden their coalition. The People’s Climate Movement brought together 900 organizations including social justice groups, environmental organizations, faith leaders, labor activists, people of color and indigenous people. Sierra Club Executive Director Michael Brune said this march demonstrates, "the true power of the climate movement." Mary Nicol, senior campaigner at Greenpeace USA, said. "We have a long struggle, but we know we will win. We will win because we stand for justice, the truth and the rights of all people." Some have questioned their ability to keep up the pressure. However, the 900 groups that participated have pledged to keep the momentum going. "Today's actions are not for one day or one week or one year," Paul Getsos, national coordinator for the Peoples Climate Movement said. "We are a movement that is getting stronger everyday for our families, our communities, and our planet. To change everything, we need everyone." Nancy Whittier, a sociologist at Smith College who studies social movements, says effective movements are characterized by an ability to "harness and channel all of this energy and fury" in a lasting way. Just two days after the Climate March, another resistance event took place called May Day. Like the protests that preceded it, this event enlisted the support of a broad coalition of advocacy groups. The May 1, International Workers' Day event included protests, marches, and strikes in more than 50 cities. May Day organizers are calling their movement "Beyond the Moment", and while the focus is on racial justice, environmental justice issues are featured among a wide range of social justice issues. Organizers of the climate movement and the May Day protest have drawn inspiration from Dr. Martin Luther King and built a strong coalition of progressive causes. The May Day event was launched on April 4, the 49th anniversary of Dr. King "Beyond Vietnam" speech. These events are not just actions they are part of ongoing activism. "We understand that it's going to take all of our movements in order to fight and win right now," said Patrisse Cullors, a co-founder of one of the Black Lives Matter groups. "What you're seeing is natural allies coming together to organize, to grow bigger, to get stronger, and to build power…This is a very dangerous time, and we're taking it very seriously."